The Cheergerm contribution to this slap up were dainty little mushroom and feta frittatas. Puffy, light and earthy from the thyme and mushroom; they were a nice addition to a motza of delicious afternoon tea delights. This was the kind of spread from an Enid Blyton storybook. I half expected old Moonface himself to pop his head in and say ‘Hullo, oh, what have we here? What a top drawer afternoon tea. May I have a piece of cake?’ (To which the answer would have been a resounding, why yes Moonface, help yourself!) 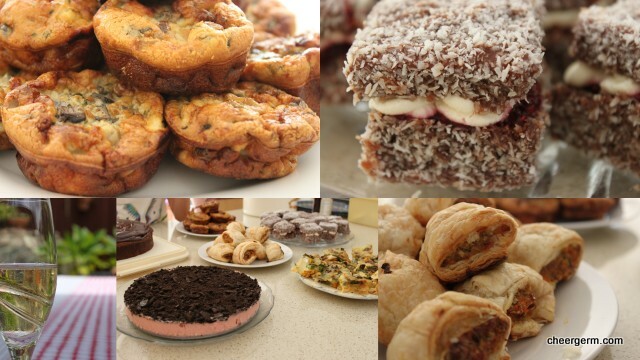 There was a pumpkin and veggie frittata, crispy homemade sausage rolls, dreamy gluten free lamingtons, fluffy pikelets, a gorgeous rich missisippi mud cake and spanokopita. The Polish contingent provided a delicious apple cake and peach cake (that had also been freed of gluten) and a vibrant marshmallow and Oreo cheesecake. We sat in the sun, ate, talked and laughed, then ate some more. These beautiful people left a little bit of Poland behind and we hope that a little bit of Australia is forever tucked away in a corner of their hearts. 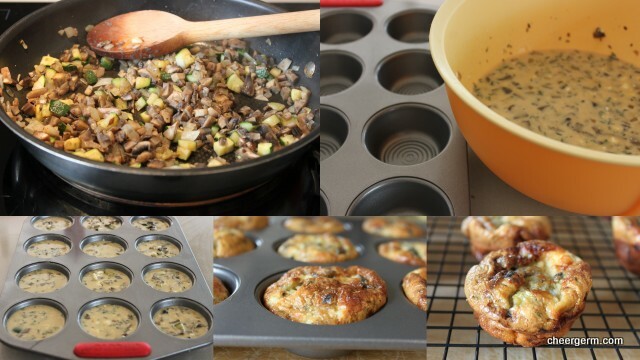 Lightly oil a 12 pan non-stick muffin tin. Heat olive oil in a frypan and cook onions over a medium heat for a few minutes. Add the zucchini and cook until they start to soften. Add the mushrooms and cook the mixture until any liquid from the mushrooms is reduced. Season lightly and allow to this mixture to cool. Preheat oven to 180C or 170C fan-forced. Beat the eggs and cream together in a medium sized bowl. Stir in the mushroom mixture, thyme and gently fold in the feta. Check for salt and pepper, add more to taste. Spoon the mixture evenly into the prepared tin and cook for 20-25 minutes, until puffy and golden. They will deflate as they cool, so don’t freak out. Serve warm or cold, they would also be great for a picnic. 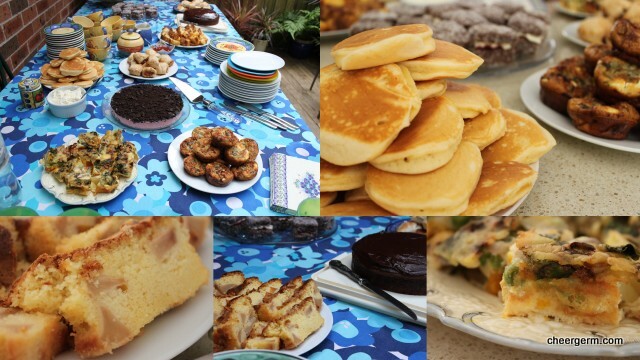 This entry was posted in Family memories, Gluten free main courses, Vegetarian and tagged afternoon tea, cheergerm, Cooking, eggs, Enid Blyton, food, gluten free, mini mushroom and feta frittatas, recipes, Vegetarian. Bookmark the permalink. Another wonderful afternoon from the looks of it……and have I mentioned lately how I very much enjoy the way you blog? I love the stories as much as the great food ideas! Just wanted to mention that ! Hello again, thanks Mrs H. Something mucked up with my replies so sorry if this is doubling up! It was a delicious afternoon tea, we love Enid Blyton too. Ha! Not sure that motley crew would have approved, no pop cakes in this spread! Wonderful! 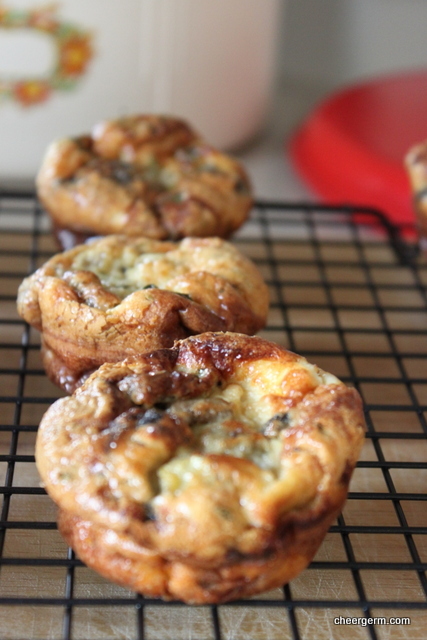 Only recently did I think about making mini frittatas in lieu of mini quiches. Instead of stressing about the pastry just make a damn delicious filling. You have given me the courage to give it a whirl for a do planned for next weekend. Yum, yum, yum. I feel like a take away a little bit of Australia in my heart every time I catch up on your delicious adventures. Cheers! 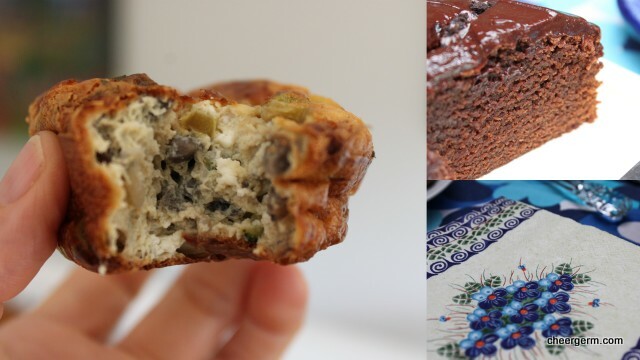 A delightful post,and those mini frittatas look and sound so good! 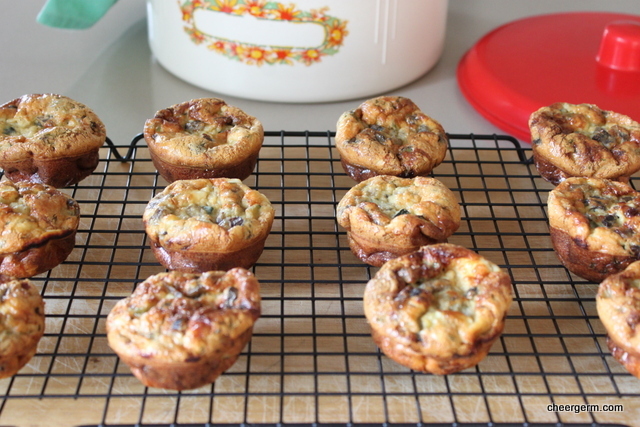 I love the idea of cooking the fritattas in the muffin tin! It makes for maximum browning and crispy bits. The whole spread looks scrumptious, but “lamingtons” and “pikelets” are mysteries to me. Are the little golden brown pancakes by chance the pikelets? Good point LM! They are a yummy combo of soft and squishy and caramelised bits. Yes, pikelets are small and puffy golden brown pancakes and lamingtons are a very Australian amazing concoction of sponge cake, cut into squares, dipped in chocolate and rolled in coconut. They are often filled with fresh jam and cream. Mmmm, could go one now. Both sound delicious, and I’m intrigued by the names! 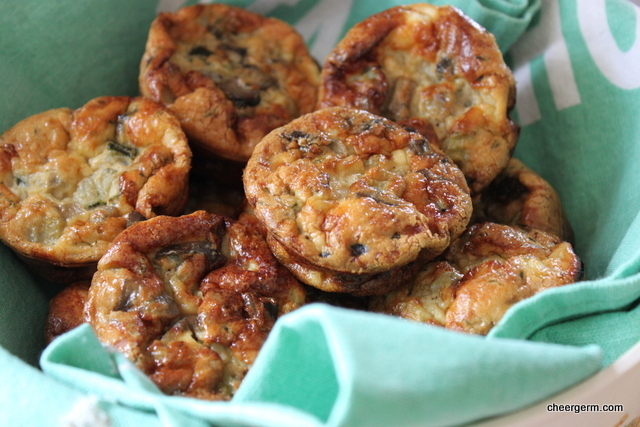 How wonderful – mini fritattas! Thanks Ms Chef! They are a lovely wee morsel to add to a party. What a wonderful EB spread for afternoon tea. Here in Blighty we only seem to grab a mug of strong black Yorkshire tea when the mood strikes – usually sometime in the afternoon – and call it “tea”. Of course, in Yorkshire, “tea” really means a substantial meal in the late afternoon/early evening. I love these little mushroom fritters (or really any kind of fritter). What a great way to say farewell! Thanks KW! I wish every afternoon tea was as good as this! It’s always confusing the whole English ‘tea’ and ‘dinner’ thing isn’t it? We are a fan of Yorkshire tea in this household, good and strong. My Mancurian bro in law calls a good strong cuppa, ‘builders tea’, which has kind of stuck. The recipe as always looks wonderful. I need to chime in with everyone else – love reading your blog – it draws me in, is beautifully written and engaging. As always Mrs CG, you turn out such an amazing feast ! Such a great way to say farewell too. I have mini muffin trays I bought just for baking picnic frittatas. I’m inspired to dig them out again. I want to be that Mr. Moonface. I would like to have the ability to aparate right into the middle of any of your meals, Cheergerm. As soon as a few new physics laws are unveiled, I am so there. And I promise to do the dishes before popping home again. Deal? My invitation must still be in the mail! I am sure you would have been more than welcome if you had of been in the vincinity! You just need a ‘beam me up Scotty’ type invention. He he…Thanks Ms Cake! Nothing like a fictional character from a children’s storybook popping into a party to liven things up!! These look perfect for a quick little afternoon tea or evening snack by the pool. Anything lacking the flour component is very appealing to me. A little mini quiche puff. Must try soon. These look so scrumptious, and I have so much thyme on my hands (lol) that I’m going to give these a bash! Oh, yumm. I’ve been thinking for a while that you need adopting. Let me know. Loved Enid Blyton stories though not too happy to have seen a loosely based bio on her life. I always thought that Moonface was the grownup of the crowd. Open to all proposals, especially If things get hairy here…ie when the boys are hairy teenagers perhaps? Yes, I have read one or two negative things about her, was that the BBC drama series with Helena Bonham Carter? I have never seen it, I have great childhood memories of all the Faraway Tree and Wishing Chair adventures. Moonface really was the most grownup even if he could get a tad cranky! Yes, it was the Helena Bonham Carter version. Do stay away from it. Hairy teenage boys, oh yeah. But I’m here to tell you that they come back full circle to the sweet lads they used to be. Just reminded by Madame Sandra how good these are!